Everything is connected in the Universe - fleeting moments, centuries and millennia, lights and shadows, stones and stars. What we are trying to capture and share are these inherent interconnections between all things, creatures, time and space. Hi! 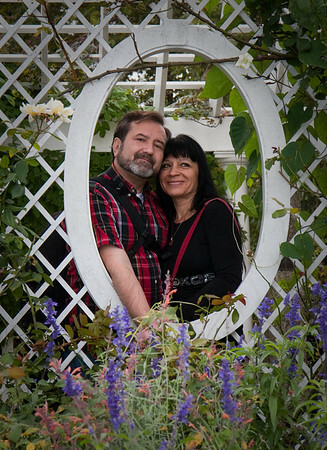 That's us on the photo: Sergey and Olga. Since we moved to California in 2010, we have taken every opportunity to spend time in pristine places, away from civilization. We are stunned by the grandeur and beauty of this land! We immerse ourselves in nature; we stay for days by the dunes, in the mountains and valleys, on ridges above the ocean and on the shore. We give ourselves time for the initial overwhelming awe to settle deeper inside. Then the eye starts to see better and the brain starts working on how to share the experience with others. Being in nature makes us feel alive. Photography is our way of sharing this feeling. What we are offering on this site are our favorite images printed in a relatively new technique that results in a very impressive presentation. Quoting from inventors at BayPhoto.com: "MetalPrints™ represent a new art medium for preserving photos by infusing dyes directly into specially coated aluminum sheets. Because the image is infused into the surface and not on it, your images will take on an almost magical luminescence. You've never seen a more brilliant and impressive print! Colors are vibrant and the luminescence is breathtaking. Detail and resolution are unsurpassed." Any image from this site can be ordered as a "metal print" available in different sizes. Every metal print is coming ready to hang. A Float Mount Hanger is attached to the back of the print, and floats the print 1/2-inch off the wall when hung. We are print quality maniacs. While the printing company we use is famous for excellent quality results, we still inspect every ordered print personally to ensure you get the best print all the time. When you place an order, the resulting print comes to us first and we will not release it to you unless we are totally satisfied with the result. If you live in the Bay Area, we will probably personally deliver the print to you.